A partnership of education, parent, and business groups is aiming to put on the November 2012 ballot an initiative combining sweeping education reforms with a tax increase dedicated to preschool to twelfth grade, called The 2012 Kids Education Plan. In a short statement (see below), the dozen groups used the code words for fundamental changes in school funding and personnel laws like teacher tenure without yet citing specifics: “a student centered finance system, true transparency, significant workforce reforms, and new investments in education through a statewide broad based revenue source and lowering the voter threshold on local revenue” (a reference to the current two-thirds majority needed to pass a parcel tax). 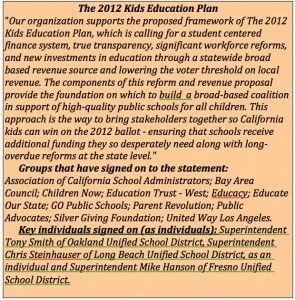 Joint statement by the groups and individuals in The 2012 Kids Education Plan. Ted Lempert, president of Oakland-based Children Now, said the groups were considering a tax that would raise $6 billion to $8 billion annually for education – the equivalent of roughly an additional $1,000 to $1,330 per student – an amount that would recover much of the state funding that has been cut over the past three years. While a big ask in a recession, it would still fall shy of raising California’s per-student funding to the national average. Those who have signed on to the effort so far include one member of the Education Coalition, the Association of California School Administrators; Children Now; Bay Area Council, a San Francisco-based business group; United Way of Greater Los Angeles; Education Trust-West; Public Advocates; San Francisco-based Silver Giving Foundation; the new parent groups Educate Our State, Educacy and Parent Revolution; and three prominent superintendents: Mike Hanson of Fresno Unified, Chris Steinhauser of Long Beach Unified, and Tony Smith of Oakland Unified. The presidential election ballot is expected to be jammed with initiatives, including pension and state governance reforms. Lots of ideas for tax increases – reconfiguring Proposition 13, hitting up millionaires, taxing oil production to support higher education – are floating around, though still in flux. Lempert said that a broad-based tax that business groups could support, focused on pre-K to grade 12 education, would most appeal to voters and have the best chance of passing. With big backers behind it, a Kids Education Plan would dominate, if not chase off, other initiatives. The need to settle on the initiative’s wording and to start collecting signatures by January at the latest leaves only about two months to reach agreement on which reforms and which tax. Consensus will demand few hard-and-fast positions. A student-centered finance system with transparency is shorthand for replacing the complex system of legacy-based funding, with dozens of categorical grants, with a system based on student needs, with more money for poor students and English learners. The principle behind workplace reforms, Lempert said, is removing obstacles in state law preventing districts from exerting more control over hiring, including tenure, and promoting and dismissing staff. Three groups in the coalition – United Way of Greater Los Angeles, Public Advocates, and Education Trust-West – have pushed for more rigorous evaluation systems. Public Advocates also represents plaintiffs in the suit Campaign for Quality Education, charging that the state inadequately funds its schools. Several key bills now before the Legislature would address some of the initiative’s key reforms: Assemblywoman Julia Brownley’s AB 18 on school financing and Assemblyman Felipe Fuentes’ AB 5 on teacher evaluations. But, reflecting both the compressed timing and uncertainty over whether the Legislature will pass strong bills, the coalition intends to write the reforms into the initiatives, leaving perhaps companion bills to the Legislature. In an email, California State PTA Executive Director Paul Richman said that the PTA disagrees with this approach, while expecting to support one ballot measure funding education next year. “We believe new funding to restore programs that have been cut for students is foremost and that other potential reforms, many of which we’d get behind, can be accomplished legislatively,” he said. It may be if the intent is to ensure that reforms are passed, not watered down or frittered away by the Legislature. Public schools in California are in a state of crisis and our students are suffering the consequences. Our children deserve and require more attention, resources and support. While there has been no shortage of plans and policies for what our schools need, there seems to be a lack of political will to actually institute the needed reforms. Last week, as an example, California’s Superintendent of Public Instruction, Tom Torlakson, published a comprehensive and reasonable series of recommendations coined “Blueprint for Great Schools.” Torlakson gathered a 59-member Transition Advisory Team, made up of teachers, parents, administrators, labor and business leaders, with input from thought-leaders such as Professor Linda Darling-Hammond of Stanford University School of Education and David Plank, executive director of PACE, to craft the document. The recommendations address finance, curriculum and technology, to name a few, and the “Blueprint” could revolutionize the California public education system. Nevertheless, Torlakson’s “Blueprint” is not particularly divergent from other reports put together in recent years by consortiums of the best-schooled in California education policy. For instance, “Getting Down to Facts,” an independent research project requested by Gov. Schwarzenegger’s Committee on Education Excellence in 2007, was authored by many of the experts who worked on Torlakson’s “Blueprint” and outlined many of the same reforms and improvements. This 2007 report received, and continues to receive, many accolades from policy makers, legislators and education advocates. The problem seems to occur in implementing these ideas. In 2008, Assemblywoman Julia Brownley attempted to create a committee focused on making these recommendations a reality; her bill flew through both the state Senate and the state Assembly on its way to becoming a law, only to be vetoed by the sponsor of the 2007 report, Gov. Schwarzenegger. During the past eight months since Torlakson took office and commissioned this “Blueprint,” California’s K-12 public education system has taken several large steps backward. School days have been shed, talented teachers have been lost, and the state’s achievement level is among the country’s bottom 10 percent. Moreover, California’s current budget will prove truly disastrous for schools wiping out even more money from schools if budgeted revenue targets are not achieved. In summary, California’s Legislature claims to value education, but the lack of action since 2007 tells a different story. As a parent of three young kids in the California public school system, I am pleading with the Legislature, the public, and my fellow parents: enough planning, enough studies. It is time to BUILD! We don’t need more ideas – we need to put the plans into action. So let’s get our hard hats on and get to work. NOW! Crystal Brown is co-founder and president of Educate Our State, a parent-led, grassroots, statewide campaign fighting for high-quality public education in California. She is a Bay Area native, 17-year resident of San Francisco, and mother of three young girls. She has served on the PTA Board at Sherman Elementary School and in early-2010, she and five other “PTA moms” organized a 1,200-person town hall meeting, Public Education–Funding Our Future, looking for solutions to the local school funding crisis. Even before the traumatic $18 billion in accumulated cuts to school funding since 2009, the underlying school finance system had devolved to one that disproportionately denies low-income students and English learners an equal shot at learning the state’s academic content standards. Two constitutional challenges currently winding through the courts are confronting the fact that our districts are underfunded overall and that high-poverty districts and schools generally spend below or only at the state average even while they are trying to serve a needier student population. Yet here come the budget cuts, heaping more shame and inequity on an already shameful and inequitable school funding system. If the state is not going to sufficiently fund our schools, it’s at least imperative to stop adopting policies that impose cuts in ways that harm the poorest and most educationally disadvantaged students. Let’s start with the “categorical flexibility” the Legislature granted to districts in February 2009, which allows schools to spend funds allocated to 40 categorical programs for any educational purpose. The introduction of flex categorical funding has paved the way for school districts to shift funds away from categorical programs that are often designed to assist disadvantaged students. A recent study conducted by RAND and PACE Research Network confirms that districts have been using flex categorical funds to help balance their general budget – rather than using them for the purposes for which they were originally intended. According to the Legislative Analyst’s Office (LAO) 2011 report, the shifting of these funds has led to reductions in funding for several programs intended to assist disadvantaged students. For instance, 75 percent of school districts polled by the LAO have shifted funds away from “Supplemental Instruction,” 72 percent have shifted funds from the “Pupil Retention Block Grant,” 68 percent have shifted funds from the “Targeted Instructional Improvement Grant,” and 63 percent have shifted funds from “supplemental instruction for students failing the high school exit exam.” The LAO also reports that some districts have completely eliminated some of these important programs. Many school administrators now express concern, as found in the RAND report, that categorical flexibility and the shift in funds away from the support of disadvantaged students is increasing inequitable educational opportunities in California. Many organizations, including my own, have complained that rules adopted by the California Department of Education associated with flex categorical funding make it very difficult to track and analyze state K-12 funding. Following the shift to flex categorical funding, the Public Policy Institute of California observes that revenue codes for flexed programs were terminated, and the RAND report further found that some districts no longer track spending for individual programs. Therefore, a full understanding of the disproportionate effects of flex categorical funding may not be possible. Don’t get me wrong. I’m generally in favor of expanding district flexibility and reducing the too numerous categorical programs that have sprouted like wildflowers in California’s school finance system post-Serrano. But flexibility is supposed to help better serve student needs, not to facilitate underserving the neediest students. The fact is the state’s education funding cuts, when combined with the new flexibility, have led to high-poverty schools reducing and eliminating critical programs and services at far greater rates than low-poverty schools. A 2010 report from UCLA/IDEA shows that high-poverty schools are nearly three times more likely than low-poverty schools (49 percent vs. 17 percent) to eliminate summer school outright and four times more likely (65.6 percent vs. 15 percent) to experience teacher layoffs. Another report by UCLA/IDEA in 2011 shows that 25 percent of the basic-aid or high-local-revenue districts studied cut instructional days compared with more than 50 percent of other districts, and that 25 percent of the basic-aid or high-local-revenue districts reduced counseling staff compared to more than 50 percent of other districts. Furthermore, IDEA reports that in 2008-2009 middle schools serving more than 90 percent Latino, African American, and American Indian students were almost 10 times more likely than schools with a majority of white and Asian students to experience severe shortages of qualified teachers. The Association of California School Administrators found that, since 2008-2009, overall categorical program funding has been cut 20 percent compared to a general aid or “revenue limit” cut of just 10 percent. Combine that with the Public Policy Institute of California’s (PPIC) observation that high-poverty school districts generally receive more categorical funding than low-poverty districts, and it’s clear why these budget cuts are having a far greater effect on disadvantaged California students. The picture that emerges is one of districts struggling to retain the core program – a teacher in front of a classroom – while being forced and permitted to cut all the supplemental programs around the core that are designed to give low-income students, English learners, and students with disabilities meaningful access to the general education curriculum. The last three budgets have included payment deferrals as a way, on paper at least, to avoid programmatic cuts. For example, the 2011 LAO report shows that in 2010-2011, 17 percent of the Proposition 98 school funding guarantee was “funded” by amounts borrowed from the next fiscal year. In other words, the state promises the money now but sends it to districts next year. The report goes on to show that, in response to recent deferrals, 74 percent of districts have drawn down district reserves, 45 percent have borrowed from special funds, and 28 percent have relied on external borrowing. Furthermore, more than 20 percent of districts report they have, in fact, made programmatic cuts rather than borrow. Finally, things have become so dire that we are seeing a breathtaking increase in the private financing of public education in California. The RAND report observes that many districts are using donations from parents and foundations to fill the critical gaps created by the loss of funds. The use of external funding sources, however, greatly favors low-poverty schools. According to the 2010 UCLA/IDEA report, 80 percent of schools receive donations from parent organizations, but low-poverty schools on average receive eight times more ($167,797) than high-poverty schools ($21,319). The UCLA/IDEA 2011 report also shows that schools with few students from low-income families received on average $100,000 in donations compared to $5,000 for schools with a high proportion of poor students. Of course parents should be able to support their local schools to add enrichment opportunities. What’s disturbing about the California scenario is that parents are being asked to fill the shoes of the state by funding core educational programs like music and art and, increasingly, salaries for critical teaching and student support positions. As a result, the wealth gap in our state is translating more than ever into a tangible opportunity gap. California is at the bottom nationally in terms of its level of per-pupil spending and in the percentage of personal income spent on public education. Its school finance system is built on 40-year-old anachronistic formulas that bear no relation to delivering the resources necessary for providing a standards-based education. As the Stanford Getting Down to Facts studies demonstrated, the system now sends widely divergent amounts of funding per pupil to districts of similar size and demographics without any relationship to student needs. Finally, the system fails to sufficiently take into account the extra needs of low-income students and English learners, particularly when they are concentrated at the same schools. Rather than addressing any of these inadequacies or inequities, the state has chosen to sink our children’s educational prospects lower and lower with unprecedented funding cuts. And rather than protecting the neediest students in these tough times, our policymakers, with their categorical flexibility, deferrals, and increased reliance on local fundraising, have served up the most severe cuts to those who can least afford it. It’s time for our policymakers to reverse these funding cuts and address the underlying inadequacies and inequities within our school finance system. And to the extent that any such ultimate solutions remain a distant hope, Sacramento needs to stop this unfairness and take a much more nuanced approach to imposing its fiscal pain on our children. The next dollars that have to be cut should be cut as far away as possible from the neediest students. John Affeldt is Managing Attorney at Public Advocates Inc., a nonprofit law firm and advocacy organization that challenges the systemic causes of poverty and racial discrimination by strengthening community voices in public policy. He is a leading voice on educational equity issues and has been recognized by California Lawyer Magazine as a California Attorney of the Year, by The Recorder as an Attorney of the Year, and as a Leading Plaintiff Lawyer in America by Lawdragon Magazine. As bleak as it looks for school funding this year, the stars may actually be aligning for school funding reform. Assemblywoman Julia Brownley, who chairs the Assembly Education Committee, is betting that this year the Legislature will pass a more equitable and simpler method for funding K-12 schools. And she and Gov. Jerry Brown agree, at least in principle, on what it would look like: a uniform per-student funding formula with extra dollars for low-income children and English learners. Brownley is sponsoring an open-ended bill, AB 18; the first hearing on it will be March 23. Current funding formulas are opaque and unfair. Funding varies by districts, based in part on funding levels set 30 years ago for reasons no longer defensible. Disparities are compounded by differences districts receive in categorical funding – money allotted for specific programs. “Our current system is complicated, convoluted, and not designed toward meeting our goal of ending the achievement gap,” Brownley told me last week. A weighted student formula, created by blending together many categorical programs and then allocating extra dollars based on student needs, would be cleaner and clearer. Brown endorsed the idea as part of his campaign platform. But, of course, it’s the details that matter: Should regional costs of living be considered? Should low-income students be given 10 percent or 20 percent more? How do you ensure that the extra money is spent on those children? It will be a few years before a new formula takes effect, even if there is agreement on it. Brownley and others agree that districts wouldn’t receive any less than they currently get now. New money will be needed in order for the formula to work. Two years ago, Brownley, a Democrat from Santa Monica, thought she was making progress toward the goal, when the Legislature (with rare large bipartisan majorities) passed her bill, setting up a broadly based study group on finance reform. It would have based its work on conclusions of Getting Down To Facts, a series of Stanford-coordinated studies from 2007, and recommendations in 2008 of Gov. Schwarzenegger’s Advisory Committee on Education Excellence, which endorsed the weighted student concept. But Gov. Schwarzenegger vetoed Brownley’s bill and, in one of his more baffling veto messages, dismissed the study group as creating “the appearance of activity without actually translating to achievement.” This was odd, considering it was Schwarzenegger who made it clear he didn’t want anything to do with financing reform that could cost the state more money. So this year, Brownley is not resurrecting the idea of a working group and instead is cutting to the chase, with hopes that she’ll have a bill passed and signed by the end of the year. She said she planned to confer with Superintendent of Public Instruction Tom Torlakson and State Board of Education President Michael Kirst, who, with two others, created his own version of a weighted student formula. The creation of a foundation-funded non-profit organization led by seven superintendents is a further sign that the momentum for reform in California has shifted from Sacramento to school districts. The seven superintendents, from Los Angeles, Long Beach, Sacramento, Fresno, San Francisco, Sanger, and Clovis unified districts, led the state’s second-round application for the federal Race to the Top competition. Although they failed to win any money, they agreed that their collaboration was worth continuing. Now, with $3 million from the San Francisco-based Silver Giving Foundation, the seven will be able to continue their work through CORE, the California Office to Reform Education. Both Phil Halperin, the benefactor behind Silver Giving, and Fresno Unified Superintendent Michael Hanson expressed optimism that other large foundations would contribute to the districts’ efforts. That would be a coup, since over the past year national foundations, including Gates and, to an extent, Hewlett, have pulled back from underwriting large-scale state-based reform initiatives in California, after they led nowhere. Hewlett funded the Getting Down to Facts studies of school governance and finance and the Governor’s Committee on Education Excellence, which Gov. Schwarzenegger promptly ignored. The Legislature has been consumed with budget deficits. Grassroots, district-led reforms represent a more promising strategy. Silver Giving has created a second organization that will focus on district reforms: California Education Partners. One of the principals is Rick Miller, the former Deputy State Superintendent who organized the state’s first Race to the Top proposal. As its name implies, CORE’s first project will be fleshing out the Common Core standards in math and reading, which California approved in August. The adoption of Common Core will require new textbooks, curriculum standards, teacher training, and assessments within the next four years, with no promise, other than end-of-the-year tests, the federal government will fund any of them. Hanson said the seven districts initially will create formative assessments – diagnostics that help teachers with instruction ­– in math and writing for elementary and middle school, which will then be made available statewide. Then the seven partners will continue the work outlined in their Race to the Top application. These include creating a new system of evaluations, based on student achievement; sharing data to guide policy decisions; and developing effective models to transform failing schools. Only Fresno’s teachers union signed on to the Race to the Top application, but Hanson said that all of the districts will work closely with their unions moving forward. “We have long recognized that the capacity at the state and federal levels is not there to fix what ails us,” Hanson said. “We have the capacity within our districts” to make change. “The State of California is failing to keep its promise of an education to our children,” states the opening lines to a 52-page complaint, Campaign for Quality Education v. State of California and Gov. Arnold Schwarzenegger. The latest suit follows by two months the filing of similar litigation, Robles-Wong v. California, by the big powers in Sacramento: the California School Boards Assn., Association of California School Administrators, the state PTA and nine school districts. The new coalition also filed its suit in Alameda County Superior Court, in anticipation that the two suits will be combined and as an indication of mutual interests as well as distinct goals. In filing a lawsuit later this year challenging the adequacy of state education spending, the California School Boards Assn. and partners will have a goal in mind: a return to local control of K-12 funding. In their long-anticipated suit over adequate funding, the California School Boards Assn. and its parter in the Education Coalition, the Association of California School Administrators, will challenge the state not only on how much it spends on public schools — no surprise there — but also how it funds them. They plan to revisit the ’70s, with its historic Serrano decision, which equalized school spending, and Proposition 13, which shifted control funding and power to Sacramento. They’ll argue that it’s time to take another look and this time do it right.